"Moist and delicious. Once you make it you will always be asked for more banana bread. Just try it!" Preheat oven to 350 degrees F (175 degrees C). Grease and flour one 9x13 inch pan, or two 7x3 inch loaf pans. Combine banana and sour cream. Set aside. In a large bowl, cream together the margarine and sugar until smooth. Beat in the eggs one at a time, then stir in the vanilla and banana mixture. Combine the flour, baking soda, baking powder and salt; stir into the banana mixture. Spread the batter evenly into the prepared pan or pans. Bake for 50 minutes in the preheated oven, or until a toothpick inserted into the center of the bread comes out clean. I MADE THIS RECIPE FOR MY HUSBAND. WE DID NOT CARE FOR IT AT ALL! I DID NOT LIKE THE SOUR CREAM IN IT. DO NOT WASTE YOUR TIME OR INGREDIENTS ON THIS ONE! 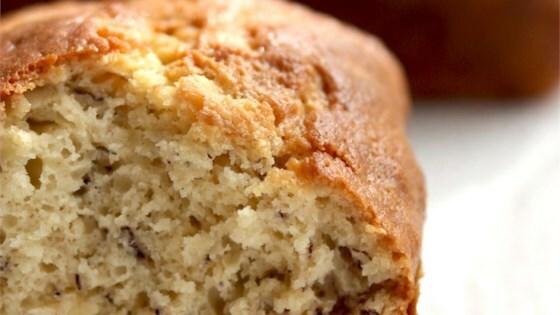 I have tried a lot of banana bread recipes and this is the best yet. I cut back to only 1 cup of sugar and added 1/2 cup of chopped walnuts. Very moist and disappears fast!! I also used plain yogurt instead of sour cream and it came out so moist! This was by far the best banana bread recipe I have used. Excellent! I've cut down the sugar content to 1 cup and it is still very sweet cause I used very ripe bananas. Excellent recipe. Thanks for sharing!